Ah, the illusive cat playtime. Most of us cat owners get the drill by now: we should be playing with our felines on the regular. We know that – in order to keep our pets happy and healthy – and especially if our cats are indoor-only cats who don’t get stimulation and exercise running around after bugs, birds, and little rodents outside – playing with our cats is a requisite. But knowing that we should be playing with our cats doesn’t mean we’ve got all the knowledge we need to create the ideal playtime routine for our kitties. There are still an avalanche of questions to be addressed, all related to play. Today, I’ll be answering the questions that relate to frequency and duration when it comes to playtime with cats: How much play do cats really need? 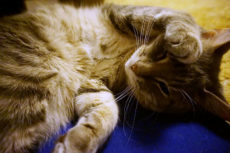 How often is it best to play with our furry felines? How long should the frequency of each playtime session be? Also, for those who want questions about how often and how long to be addressed even more deeply, I’ll be sharing my thoughts to these questions as well: Can you ever skip playtime? Do some cats need more play time than others? Are there ever cats you don’t need to play with? Or is there a way you can make it less necessary to play with you cat so very often? Let’s jump into the answers to these questions now. How Much Play Do Cats Need? In total, it seems the word around the net is that cats need somewhere between 20-30 minutes of playtime a day. Playing with cats helps cats relieve their prey drive; something we as humans don’t have, but many animals that need to hunt to survive have biologically built into them. 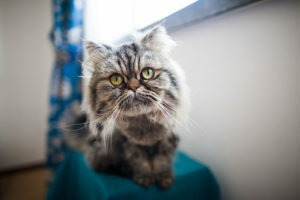 Without a good 15-20 minutes a day of play, cats can develop both physical and behavioral problems – from weight gain and constipation to acting out by doing things like hissing, scratching, and biting humans, crying regularly, demanding attention at all hours of the day, or even bullying other cats in the household. Needless to say, it’s important to play with a pet cat, and making extra sure an indoor-only cat is played with daily is a really important matter. A tip to make sure your cat is getting as much as possible out of your playtime session with him or her? 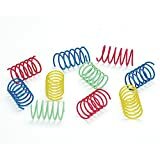 Try using not just any toys, but specifically exercise toys like these that require a high-energy output when cats play. Physically draining a cat of as much energy as possible is a huge boost to play because cats’ style of life and hunting is just that in the wild: extremely lazy and conservative of as much energy as possible until *boom* – hunting time, where cats will jump and pounce and run ridiculously fast to catch up to and snag their prey. Expending huge bursts of energy is how they catch dinner, so your goal is to try to emulate that as closely as you can during play so they can get their prey drive all revved up and spent just like they would if they were really hunting. How Often Should Playtime Be? The ideal frequency of daily play sessions with a cat depends on your individual cat. Some cats prefer to be played with more intensively for a long period of time, some find it hard to engage and stay playing for more than a few minutes, but are happy to engage in short bursts of intensive activity through play spread throughout the day. Try playing with your cat once, twice, then three times a day to test out if your cat’s happier with one system or another. Cat calling quits on playtime pretty early after only a few short minutes of intensive exercise? Try sticking to more times a day than less. Cat playing for long amounts of time when he or she finally engages, but doesn’t seem to like being engaged in play very often? Try sticking to one really long, intensive play session a day. 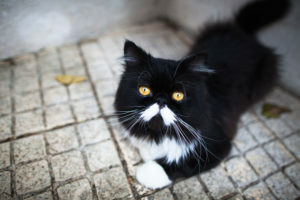 For the record, if you ever find it hard to get your cat to play with you, try using some of these techniques to encourage cats to play. How Long Should Playtime Be? Since the total amount cats should be spending in play is roughly 20-30 minutes a day, if your cat prefers to play with you only once a day, try making the single session an intensive workout that lasts a full 20-30 minutes. 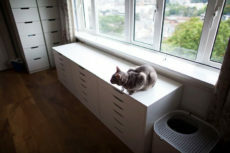 Cat prefer two play times instead of one? Try making each playtime session around 10-15 minutes long. Three times a day the best bet? Try quick 7-10 minute sessions. 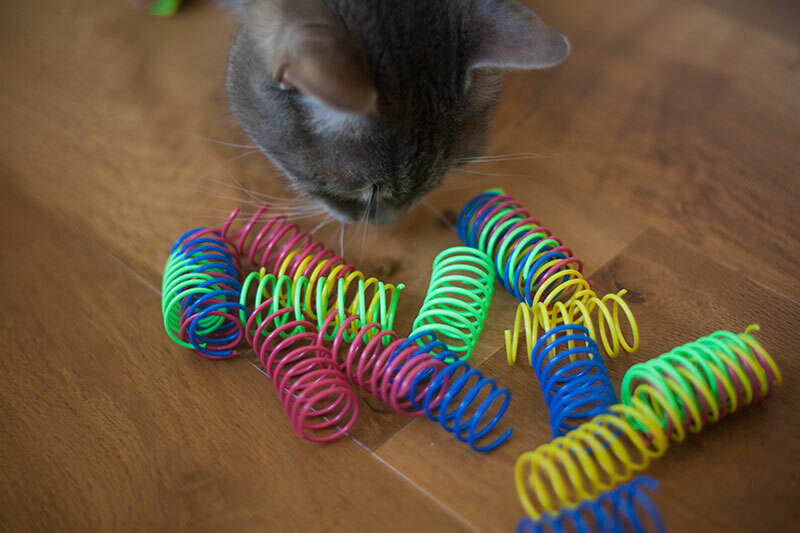 If your cat always seems ready and rearing to go, and doesn’t seem to have a personal preference with regards to frequency or length of play – do what works best with your schedule. Have a good chunk of time to play with kitty each night while you’re waiting for your dinner to pop out of the oven? Use that time for a play session. Prefer to do a quick session right before and right after you go to work, to make sure your cat is up and at it at least during these two spread apart times times? Definitely a good idea. Cats sleep between 16-18 hours a day and if you’re gone, there usually isn’t much they’ll do to entertain themselves besides napping. Of course there’s plenty you can do to make sure they don’t get bored in your absence, but they’re still a lot more likely to snooze for extended periods of time if their seemingly favourite hobby – human watching -is not momentarily available to them. Do Kittens Need More Playtime? I would think that yes, kittens do need more playtime than full-grown adult cats. 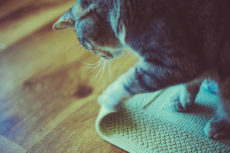 Cats seem to have unlimited energy when they’re wee, so if you ever have trouble tackling that never-ending prey drive, I’d advise taking a look at my round up of the best kitten toys. Can I Ever Skip Playtime? 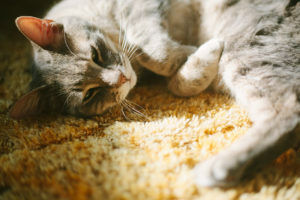 You can definitely skip a playtime or two – skip a day or two even, but you really don’t want to make a regular habit out of it, especially with an indoor cat who relies on the intensive playtime for relief of his or her prey drive. Again, physical and behavioural issues could result from skipping playtime too often, and almost certainly will result if you never play with your cat at all. It’s just not healthy for your cat’s well being, so avoid skipping play sessions frequently at all costs. In the meantime, especially if you’ve got a particularly playful/energetic cat, it’s a really good idea for you to have outlets for your cat to release his or her energy on without you being a necessary part of the equation. What do I mean by this? 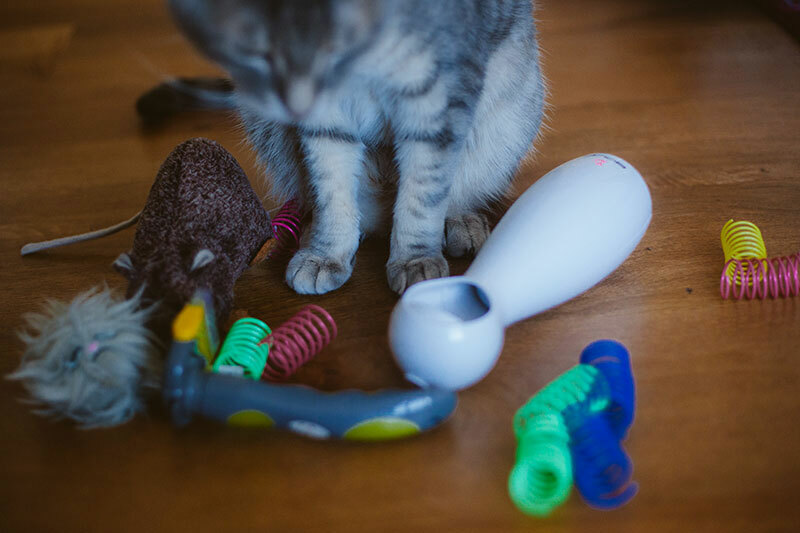 Grab a number of toys like these that cats can play with completely on their own. These types of toys include bouncy balls, cat springs, and crinkle swat toys. If they’re easy for a cat to hit, swat at, and jump on, they’re game. 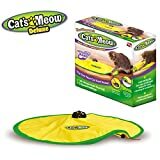 If you are actively trying to have playtime with your cat, but he or she is refusing to engage, besides trying out these techniques I mentioned, do your best to grab more of the same types of cat toys you know your cat to be in love with. 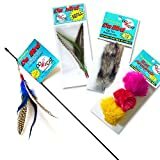 For example, if your cat likes feather toys, try grabbing more varieties of feather toys for him or her. Like ball toys? Try a slew more cat ball toy varieties. Cat like bunny kicking toys? Try more cat kick toy varieties. It’s one of the only ways I’ve ever been able to encourage my lazy cat to play, and not get completely bored with the toys he already has. Not quite sure what your cat likes yet? Try out a variety pack to see if anything in particular strikes your cat’s fancy, then get a hold of a few more similar toys. 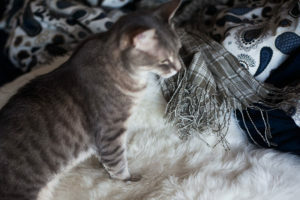 If you really struggle with getting your cat to engage in play like I have in the past, you may want to do what I did and implement a daily food and fitness routine. 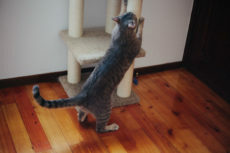 That way, your cat will at least be getting physical and mental stimulation, and while his or her prey drive will not be covered ideally, at least if you’re trying to engage your cat in play, and your cat does want to play, the offer was made and declined by your cat, rather than it being down to you. Do some cats need more play time than others? I actually feel that the answer to this question is yes, but that’s based on my personal experience rather than any research I’ve concretely done on the matter. Why do I feel this way? I have met so many cats that are way more playful and hyperactive than my Avery (okay, that’s basically every cat in existence). When I think of how much time Avery typically needs to play in a day versus how much time all the “regular” cats I know are likely to need – that’s a pretty big gap in my mind. Luckily, I do feel most of the cats that need more play time will engage in play incredibly easily compared to my Avery. Most are likely to play right off the mark, and some I know will even go so far as to play with toys by themselves for ages. 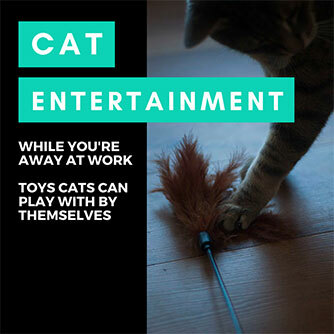 Another reason why it’s good to have self-play cat toys I guess – just in case you have a playful cat who likes spending a lot of time engaging with toys and is willing to do so completely solo. Are there cats you don’t need to play with? Is there a way to make less play time necessary? I suppose if your cat is a-okay playing completely by him or herself with self-play cat toys, it’s fine not to play with him so often. 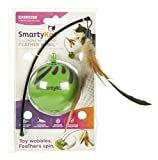 Or, of course, if you replace your playtime session with electronic, interactive cat toys that move on their own – ones like the SmartyKat Feather Whirl, the Friends Forever Interactive Cat Laser Toy, or the Cat’s Meow Motorized Wand Cat Toy. But your cat has to actually engage with these and play with them for long enough to actually merit a replacement of one-on-one cat time with you, and for a lot of cats, things don’t typically work out that way. A lot of cats tell you they’re rearing and ready to play by tapping you and running, meowing at you, and doing a bunch of other things to grab your attention. 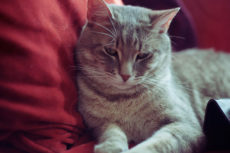 But even if your cat doesn’t do these things – that doesn’t mean you should take the risk and pass on play times unless you’re sure your cat’s getting his or her prey drive out without your help. Just because a cat’s not outright telling you he or she wants to play, doesn’t mean he or she doesn’t need the prey drive relief. Your Thoughts on Cat Play Frequency? How much play do you think cats need? Do you think every cat needs roughly the same amount of time? Do you think some cats need more playtime, while others need less? And how much time do you think is at either end of the spectrum? Have you got the perfect formula down for your cat in terms of how often and how long to play each day? 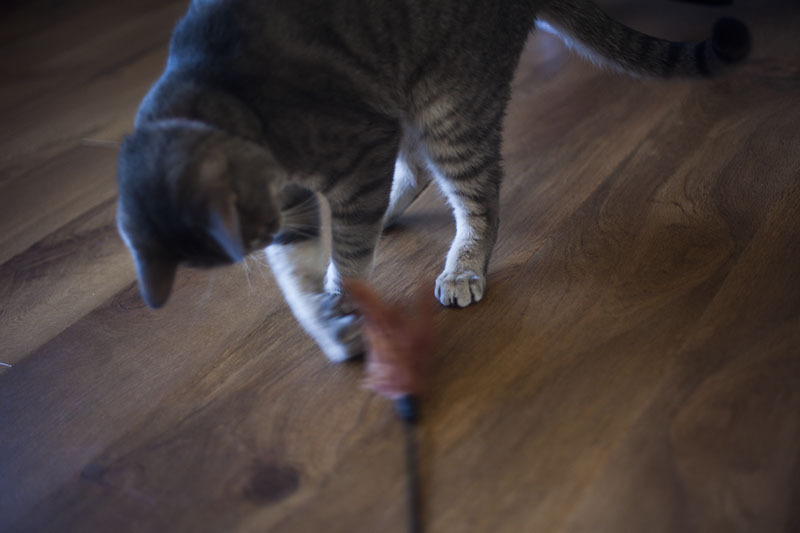 Have you ever tried replacing a playtime with an interactive cat toy? Looking forward to reading about your thoughts in the comments down below! Thanks for the wonderful share. We usually at night time have a thirty-minute playtime with catnip mouses or wand chasing. After that, they are fast asleep on the couch and are very happy with all the fun they just had. Great tips that you shared in this post. Have a wonderful rest of your day. What sweethearts. All playing together and all napping straight after. 🙂 Sounds like the perfect hour, even for the humans in the household. My cat Olly loves a good play session. I usually engage him with a feather toy whilst I’m busy with chores but if I need both hands then I always have balls strewn around the house to throw Olly’s way. This way I incorporate interactive play with self play. Olly is usually happy to end a play session running around, swatting away at one of his balls. Love the name Olly for a cat name btw. Always wanted a ginger cat named Oliver! I think it’s very smart to switch between feather toys and balls scattered around that you can throw his way, depending on how many hands you need, and to do play sessions while you’re busy with chores. Two chores down at once, it’s perfect. My cat Daisy Mae just turned 12 on Sept. 12th and loves the cooler weather so she runs around the house more than in hot weather. She’s strictly an indoor cat so she doesn’t get outside. That’s a good point about cats running around the house to get exercise. They all seem to do this every so often, don’t they – just pick up and sprint? Such oddlings, but it’s so cute when they do it.